When purchasing a streaming device people mainly want to know, how much is all this going to cost us and how feasible is this for us. I understand no one wants to throw hard earned money away. I don’t either. It’s always good to know what you’re getting into before you get into it. So I’m going to let you know what you get for your money on the services that Roku provides. Roku is a service base product. With a service like Roku, they provide a way for people to watch TV, Movies or listen to music from the Internet to their TV. It’s kind of different than cable because you pay a one-time fee for the Roku device. Roku has negotiated with services like Netflix, Hulu, and many other services to bring their services to Roku. So you as a consumer will be able to pick which services you want to add to your device from the Roku Channel Store. Unlike cable or satellite services, they provide you with channels from a package you choose. With a streaming device, you may add and take out services that you like. Some of the apps are free while others may cost one time, monthly or yearly fee. Unfortunately, Roku doesn’t provide local channels. I know a lot of people would love to see that on their Roku Devices. We all know the legal reason why, Money, Money, Money. This doesn’t rule out that one day our streaming devices won’t have local channels, but right now it’s just the way it is. I remember when satellite TV didn’t provide local channels. The had to go through a lot of legal stuff to get them to their customers. So only time will tell. When I had my first satellite TV service I believe it was called Primetime Satellite. I had to write a letter to each local channel provide it on my TV. Only two networks did it, FOX, I believe it was CBS. NBC and ABC denied my request. Eventually as you know today, Local channels are available on satellite TV. So you never know what the future will hold. If you have to have your local channels, here are some ideas you may want to consider. Keep your cable or satellite service. Downsize your cable or satellite service to fewer channels. You can just forget about local channels altogether. It’s entirely up to you what you want to do. The good news is, you gotta choice. What Kind Of Free Apps Do I Get? When you install your Roku device you can select free channels. I suggest you do that first. Once Installed you get your basic channels. I would suggest doing an update because new channels are always added. Roku provides some free channels you can watch without giving your financial information. Facebook you’re able to watch some of the clips that are loaded with your Facebook feed. Roku Newscaster gives you news from a variety of news outlets. Disney is more of previews of what coming on. You can also watch some music videos and clips of your favorite Disney Star. This is very basic and the most popular ones you can check out. I would suggest going to the Roku channel store and sifting through what you want to watch. On Roku site, it will let you know if it’s free or a paying service. Most services are paying. When You set up your Roku device you can either use your PayPal or a Credit Card account. I suggest you do this on your computer because it’s a lot faster and easier. Amazon Prime $99 dollars a year. If you shop through Amazon a lot, I suggest you look into this one, because you get free 2 day shipping plus you’re able to have access to all their movies, TV shows, and music for free. Dishworld $14.95 a month this is for international channels and you don’t need the dish to get these channels. You can just pay monthly and get that channels you want through Roku. You don’t need all these paying services, I would do some research first and pick one paying service that you like. I use Netflix because sometimes I want some DVD’s sent to my house so I can watch it at my convenience. This is your personal choice. In channel store, you’re able to add channels free or paying services you’d like. You can go to their Roku’s main site on your computer or through your Roku device and see what other programs you’d like to add. Just so you know, the more paying channels you add, the higher rate your monthly bill would be. My suggestion is, look at their site that offers paying services first, then decided on which paying service you’d like. Free is Free, so take advantage of that too. I understand there is a lot of research a person must do to find what’s best for them. What I like about streaming devices such as Roku is that you are in more control of what you want to watch. The main problem I have with a streaming device is that local channels are not provided. There are options around that such as an HD Receiver Box or downsizing your Cable or Satellite channels. >If you’re thinking of cutting the cord completely, I would suggest getting the streaming device first and see if you enjoy streaming from your TV. 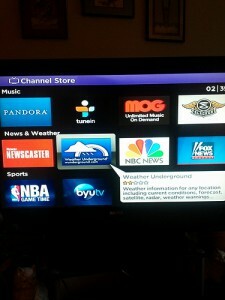 If you have any questions or comments about how much are Roku Channels, let me know below. Hey Gary, yes they do, actually you should check out this blog here. What about channels like animal planet and the history channel. I also watch the discovery channel. Are those available thru Roku? If you really like specific channels you may want to think about something like sling TV. I have been using the ROKU stick for about six months now. Here is what I have learned. Your access to the major networks requires verification that you are already paying for them through you cable provider. Convenient yes. Cost savings no. CBS has their own thing going with “all access” which they want a separate fee for regardless of your cable subscription. When it comes to services; between Amazon Prime and Netflix, Netflix is the better deal hands down. Unless you buy a lot of stuff from them on-line, the Amazon Video service is not worth the $99 IMHO. I got it for two shows. Bosch and Grand Tour which are only a single season per year. Otherwise, A LOT of Amazon movies and shows you would like to watch are available as a rental or purchase (mo-money) or through yet another (pass-thru) service like “Acorn”. The free channels on ROKU are mostly full of “B” movies but improving all the while with different program feeds from local channels around the country (you can tell by the commercials). You made a lot of valid points regarding the free channels you get through Roku, I also have Roku and yes the free stuff is not the best. As for CBS, I think they do that because and this is me assuming it, is because they air NFL games. As for the best streaming besides free is, Sling TV. No there is no CBS available there and Sling is ran by Dish Network. If people want that cable feel along with streaming you can save a lot of money that way. Your best bet to get free network channels is to get an antenna that way you can get your local news along without paying extra for CBS. If you’re more into the movies, I agree with you that Netflix is the best deal. Streaming is growing and a lot of improvements have been made since I started streaming years ago. Thanks for leaving your comment, all the best to you, Evelyn. This is a fantastic article! I might just need to switch! I am currently paying $225 from comcast for tv, internet, and alarm which I think is absurd. My big question is if you can record shows to watch later. Also, do the shows air in time with cable or do I have to wait for the season to end? I have never had Netflix or Hulu. Thanks for the compliment, it depends on how much of a big TV person you are and what you like to watch. If you are a big sports fan, I personally feel you’re better off with your cable company. I feel that streaming sports right now isn’t as advanced as I’d like it to be. If you have cable, you can stream your sports with the cable company you use. If you’re a movie person, services like Netflix, Hulu Plus and I feel that Amazon Prime is evolving, you can use those services to watch you’re favorite shows and movies. The TV shows usually air the next day. As for recording, I personally don’t do that, I just watch where I left off at. The shows and movies are all there for you in these services archives and you can select them anytime without paying any additional fee. You are going to have to get a little use to it because you’re selecting and choosing what you want to watch, rather than what is in your guide on cable or on demand. To give you the closest feel, it’s like your on demand service that your cable offers. You select the shows you want to watch. The good news though with streaming when you purchase a service like Netflix or Amazon Prime, some on demand cost money rather than you can watch what ever you want without paying any additional fees. This is what I suggest you do, you get a 30 day free trial with Netflix and Hulu plus, download their apps on your smart phone and sign up for a free trial, play around in there and see if you like it. You can also purchase a Roku and see how you like it, the good news about Roku is that it’s a one time fee, so you’re just paying for the device and nothing else. It’s more of a streaming device for your television. The fees you’d pay are from the types of services like Netflix that you choose to select. Netflix, Hulu Plus and Amazon prime are pretty much the same, the cost are way more inexpensive than using a cable service. Hey Renee, if you purchased your 2 Rokus, you shouldn’t have to pay anything else. I have no idea what this $99 dollar fee is for. The only thing that I could think of that costs $99 dollars is Amazon Prime and that is a yearly fee. If you already are using something like Netflix, Hulu, Sling and so on.. then your set. As for any charges I did not do that when I got my Roku. How Roku works is that you purchase the device, and you can add apps and you can pay for their services or you can use the free apps as well. Like I just stated earlier, if you purchased something like Netflix, all you have to do is add the app to your device if it’s not already setup and enter in your email address and password and you should be all set. If I were you, I would ask customer service at Roku what is this fee for. Yes you can get local channels! Buy a Tablo TV box and an antenna, and get the Tablo channel. You will be able to watch TV live, pause and resume, schedule what you want to watch and skip commercials just like a cable DVR. Total cost: Tablo $200, Hard Drive $50, and Antenna $50 = $300. Plus a additional $5/month for the optional guide. The stations will also stream to any other wifi connected devices in your house. I am inclined to stick with what I have as it sounds like an expensive way to have entertainment in the home. Plus, like a lot of people, I like my local channels which would involve having two different viewing systems. Absolutly awesome article and very helpful! this review is super helpful in my decision. after reading this I think I will stick with what I got, thank you you just saved me some good money. not that it doesn’t seem awesome I just like my local channels a lot. Thank you!